The Government of India, Ministry of Home Affairs, Directorate General of Sashastra Seema Bal has announced a notification regarding SSB recruitment 2017 – 18 on 872 Head Constable, Assistant Sub-Inspector & Sub-Inspector posts for all category candidates in various fields. Those applicants who are interested in applying for the Sashastra Seema Bal Recruitment 2017 and also fulfill eligibility criteria, they can send their SSB Recruitment 2017 – 18 Application Form in the prescribed format to the given address before the last date of this notification and 45 days for remote areas. Latest: The PET ADmit Card has been released, download it from the “Admit Card” page link given in the quick link box. Candidates who are going to participate in the SSB Recruitment 2017 process for the posts of HC, ASI, SI can check all the details like application process, eligibility criteria, selection process etc through this page below. Age Limit – Minimum age 18 years for all the posts. Educational Qualification – Degree in Electronics or Telecommunication or Science / Matric / Matriculation or equivalent plus. Selection Process – The selection of the candidates will be based on PET / PST / Documentation / Written Examination / Medical Examination. How to Apply – Application form for SSB Recruitment 2017 can be downloaded from the official website www.ssbrectt.gov.in. Degree in Electronics or Telecommunication or Science with Physics, Chemistry and Mathematics from a recognized University or Institute or equivalent. 10+2 or Intermediate with aggregate marks of 50% with selective subjects being Physics, Chemistry and Mathematics from a recognized Board or Institution or equivalent. Matriculation or equivalent plus two year Industrial Training Institute certificate in Electronics or Intermediate or 10+2 with Physics, Chemistry and Mathematics from a recognized board of institution or equivalent. All educational & professional qualification certificates other than Central Board/State Board should be accompanied with Government notification declaring the equivalence of such qualification for service under Central Government. Only date of birth as recorded in the Matriculation certificate will be accepted for determining the age. Note – Ex-servicemen are exempted from physical efficiency test. however, they will have to appear in common entrance test, technical test and detailed medical examination. 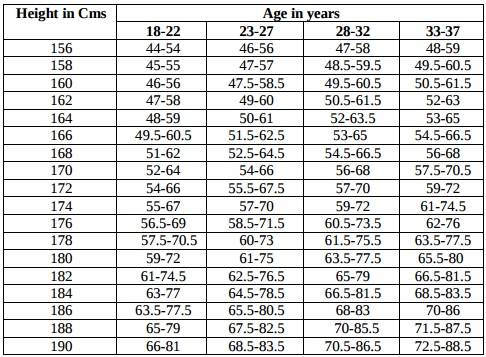 (b) Weight:- Weight of the candidate should be proportionate to height and age as per detail given below. Weight will not be disqualification at the time of PST. However, the overweight/underweight candidates will be disqualified at the time of Detailed Medical Examination based on weight and age on the day of Detailed Medical Examination and the height as measured during Physical Standard Test. Appeal against Physical Standard Test (PST) – Candidates declared disqualified in Physical Standard Test can prefer an appeal to the Appellate Authority for re-measurement of Height and Chest only. The appeals of the candidates shall be disposed of on the same day. Candidates who intend to avail relaxation in height and chest measurements will have to submit the certificate. Documentation – The candidate who qualifies the Physical Standard Test will have to go through the documentation, in which candidates will have to produce all original documents/certificates the detail of whose are given in the application form to Recruitment Board, failing which the candidate will be disqualified. Final merit list for the posts of Sub-Inspector (Communication), Assistant Sub-Inspector (Communication) and Head Constable (Communication) will be prepared on the basis of marks obtained in the Paper-II (Technical Written Examination) only. The final selection list will be prepared in order of merit, category wise, after completion of Review Medical Examination. It is hereby emphasized that the candidates who merely secure the qualifying marks and found medically fit, may not be considered for final selection since the cut off marks will be determined based on number of vacancies after the completion of whole recruitment process. Only eligible candidates may apply in the prescribed proforma. Candidates should minutely go through all the provisions in the notification to ensure that he is eligible for the post for which he is applying. Candidates should bring all original documents i.e. matriculation, technical pass certificate alongwith self attested Photostat copies of the same at the time of documentation, failing which candidates will be rejected in the documentation stage of recruitment. Name, Father’s Name & Date of Birth should be mentioned exactly as recorded in Matriculation certificate. In case of change the same must be supported by necessary documents otherwise, the candidature will be rejected. The application form must be filled in English & Hindi only and signed by the candidate in his own handwriting. Correction, if any, should be legible and attested by the candidate. Persons employed in Government/Semi-Government/Public Sector Undertakings should apply through proper channel. No objection certificate from their employer will be required to be submitted at the time of documentation. Falsification of documents to mislead the Recruitment board or to gain access to examination would lead to criminal/debar action against the candidate, besides cancellation of his candidature. No separate admit cards/call letters will be issued to the qualified candidates for written examination (Paper-I), Technical Test and Detailed Medical Examination. The list of qualified candidates called for above tests will be displayed on the Notice Board at the Recruitment venue and SSB website.